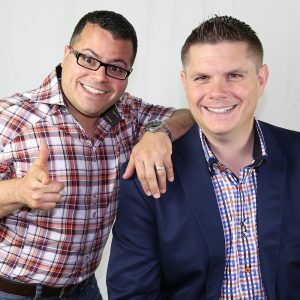 Jimmy Vee & Travis Miller are the nation’s leading experts on attracting customers and the authors of the best-selling books Gravitational Marketing: The Science of Attracting Customers and Invasion Of The Profit Snatchers. Called “The Penn & Teller of Marketing,” Jim & Travis have been helping auto dealers differentiate themselves, attract customers and increase sales for over a decade. In 2004, they created Gravitational Marketing®, an exclusive customer attraction agency for busy dealers who want to stand out and sell more without spending more in advertising. It is THE place for fun and profit in the car business. Collectively, their campaigns have resulted in the sale of over 2 million vehicles. Every month they create record-shattering automotive promotions and bring together some of the brightest and most successful dealers, authors, entrepreneurs and business people to participate in fun and insanely profitable think-tank mastermind experiences. Jim and Travis believe life and business should be ESP–Enjoyable, Simple & Prosperous®. They help make this a reality through their work at Gravitational Marketing®. Jim & Travis have spoken all over the world on their special brand of customer attraction and have been seen on or in Entrepreneur Magazine, Inc. Magazine, Investor’s Business Daily, Ripley’s Believe It Or Not, Forbes, CNBC, Fox Business, Advertising Age, Direct Marketing News, Businessweek, Brandweek, Used Car News, and many other publications and media outlets. Jim and Travis both reside in Orlando, Florida, each married with two young children.